As I will demonstrate below, none of these funds show up in GFA India’s reports to the Indian government. In other words, if one just looked at what GFA in India reports to the India government, one would not know anyone in Canada donated $15 million Canadian dollars to the work of GFA in India. Providing education to children of the Dalits and untouchables of India. Medical missions – treating the poor and needy in rural areas on the Indian subcontinent. Providing assistance in the slums. Literacy programs for illiterate adults. Disaster relief for natural disasters. Providing water for undeveloped communities. Sharing the love of God by meeting the basic needs for those below the poverty line. Sheltering street children. on gifts to qualified donees. A registered Canadian charity is required to report annually to the Canada Revenue Agency (CRA) on its expenditures, and maintain adequate books and records so that the CRA can validate whether the charity’s funds are being appropriately applied to its own charitable activities (whether inside or outside Canada), or on gifts to other qualified donees. If a charity reports to the CRA that it has spent its resources on a certain program or activity, it is incumbent upon the charity to validate that expenditure or allocation of resources. 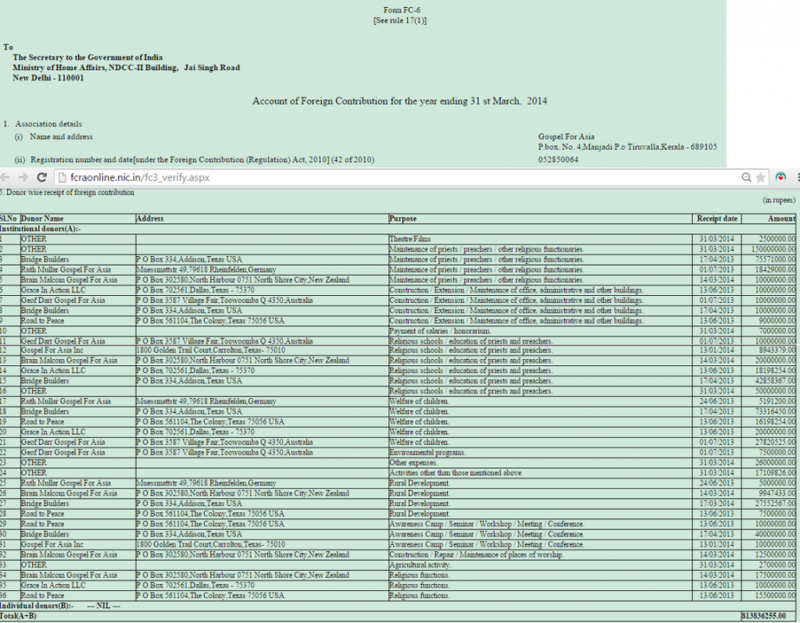 Form T301o lists “qualified donees” and Gospel for Asia International is not one of them. For this guidance, a conduit is a registered charity that receives donations from Canadians, issues tax-deductible receipts, and funnels money without direction or control to an organization to which a Canadian taxpayer could not make a gift and acquire tax relief. The same requirements for the direction and control of resources apply to charities that are offshoots of head bodies outside Canada. In other words, a charity may not simply send gifts of money to a non-qualified donee, even if that non-qualified donee is the charity’s head body. For these purposes, we will probably consider a small amount to be whichever amount is less—5% of the charity’s total expenditures in the year or $5,000. In other words, a charity may not simply send gifts of money to a non-qualified donee, even if that non-qualified donee is the charity’s head body. According to the Canadian report, GFA Canada sent the lion’s share of donations from Canadians to do work in India. 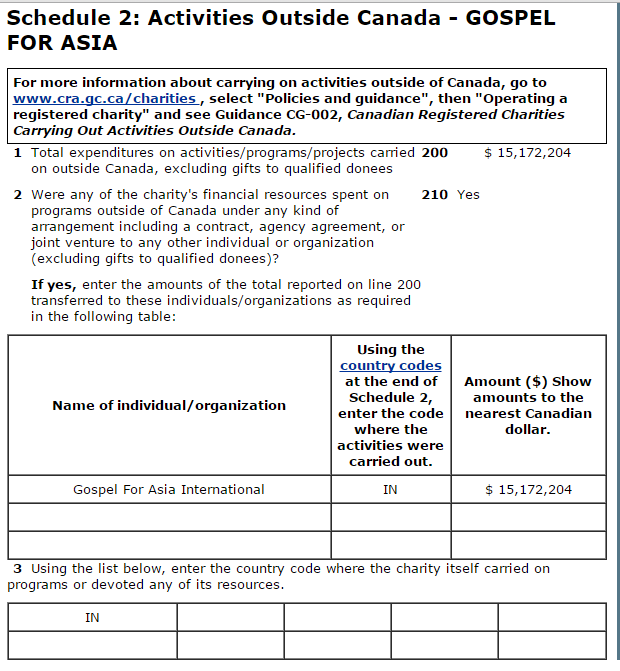 However, in Indian public charity documents (yearly FC-6 forms), GFA Canada doesn’t show up. I wrote back to ask for the auditor’s rationale and Carroll declined to address the question. According to Canadian law, Canadian charities must retain control of the funds, must keep separate books and records, and must be able to show that the funds were spent on the charity’s mission. Perhaps GFA in Canada can do that. However, on the Indian side, there is no way to verify it. What seems odd about Carroll’s explanation is that the Indian website requires the donors of those funds to be identified. For instance, in 2013-2014, the following donors were identified by GFA. Note that there are donor GFA organizations from Germany, Australia, New Zealand and the USA. Canadian law requires that the funds donated in Canada be spent for the charitable purpose intended by donors. This report in India seems tailor made to comply with that mandate. However, in the part of the form where GFA could account for where Canadian donations were spent, they fail to identify the activities paid for by those funds. Note: the figures are in Indian Rupees. 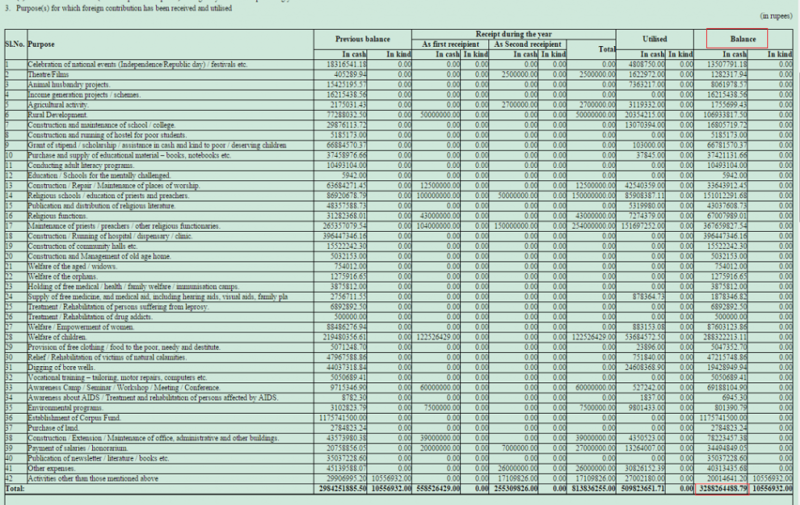 As I have pointed out before, the funds the U. S. GFA says they sent to India don’t show up on the Indian reports. The situation is worse if we take into account David Carroll’s claim that the Canadian funds are lumped in with U.S. funds in India. If Canada sent just over $15 million Canadian dollars ($14,183,700 in U.S. dollars on December 31, 2013) to India for calendar year 2013, and the U.S. sent $58,542,900 (from their 2013 U.S. audited financial statement) that adds up to $72,726,600 sent to India from the two countries. However, according to reports of foreign contributions in India, the U.S. GFA is only credited with sending $6 million during 2013. If one adds up all of the funds sent by GFA – US to Indian organizations in FY 2013 (GFA -India, Believers’ Church, Love India Ministries, Last Hour Ministries), we still only get to $37,097,750. The bottom line is that there is a massive difference in what the U.S. and Canada report that they send and what the Indian GFA organizations report to the Indian government. It is possible that the excess is sitting in an account somewhere and is being reported in some other manner in a way that is not publicly available. I freely admit I am not an accountant and that I don’t know all of the auditing rules which may apply. However, these reports are provided in the U.S., Canada, and India so that an informed person can evaluate whether or not a charity is being accountable with donated funds. Using the reports available, I believe GFA has many questions to address. Where is the money that doesn’t show up on the Indian reports? GFA’s silence does not inspire confidence. *I used the exchange rate from March 31, 2014. In a prior post, I disclosed that a dispute existed between a group of over 80 former Gospel for Asia staff and the GFA leadership. GFA former staff claims that GFA leaders engage in unbiblical practices. In response, GFA leaders claim that a board member’s investigation failed to find serious problems. Currently, an impasse exists. Until recently, most of the documentation of these concerns was unavailable to the public because the main website of the former staff group (called the GFA Diaspora) was on a password protected website. That has changed. The website — GFA Diaspora — is now available to the public. On the website, you can find rationale for the five major problems observed by the former GFA staff, a communications history regarding efforts to bring GFA leaders into reconciliation talks, a review of specific evidence including the K.P. Yohannan ring kissing video, and numerous personal testimonies of former staff which support their overall list of concerns. I was initially leaked materials from this website by former donors to GFA who believed the efforts of the staff to effect dialogue and change were not being taken seriously by GFA leaders. Since the first post, I have provided several other reports of information about GFA which I believe deserve greater awareness among evangelical supporters of missions. GFA has now ceased all responses to my questions and have failed to answer questions from one other new source — Christian Today. Perhaps open access to this material will bring matters such undeclared cash carrying, misrepresentation of ecclesiastical practices, massive cash reserves, and other concerns into greater public conversation. 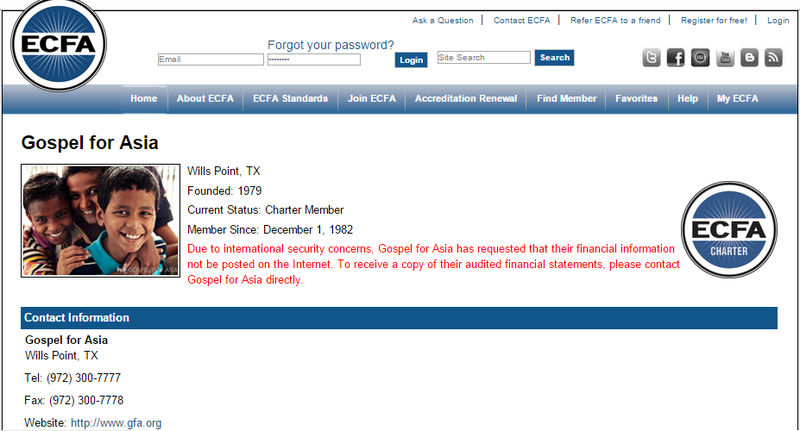 In a major departure from past practice, Gospel for Asia changed their ECFA page to include their U.S. financial information. Citing security concerns, GFA has declined to reveal this information on the web, but instead required interested parties to request it by mail. 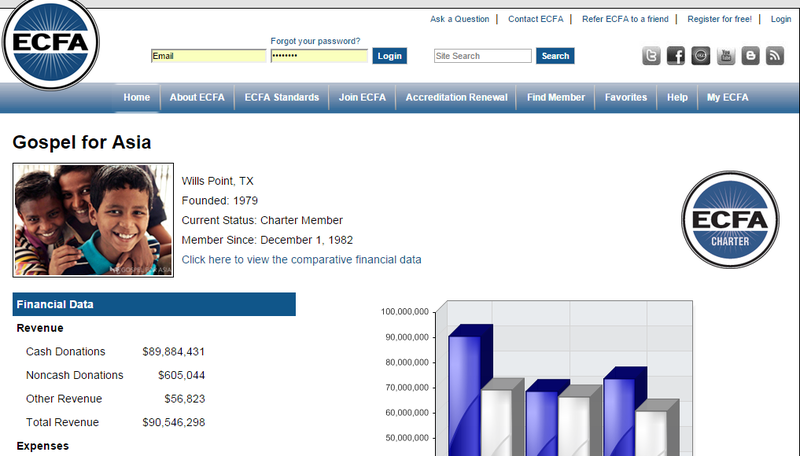 Up until now, the ECFA has allowed charter member GFA to be exempt from usual practice. In a prior post, I noted that GFA sent $58 million to India but the FC-6 forms there show only a little over $6 million received from the U.S. Perhaps, GFA is moving toward more transparency. If so, the organization still has a long way to go to explain this discrepancy, as well as the money exporting to India, and discrepancies in the Bridge of Hope program reporting. Clearly, the organization is raising massive amounts of cash but has yet to explain why so much is sitting in Indian banks. Given this change, perhaps the ECFA has been in talks with GFA and is privately working to bring GFA into compliance with ECFA guidelines. If this is true, don’t expect ECFA to alert the donating public. If the ECFA and GFA don’t see things the same way, my guess is that GFA will quietly give up their membership with no explanation. How Hard is it for Gospel for Asia to Get Money to the Field? In a staff meeting on May 14, COO of Gospel for Asia David Carroll said it was getting hard to send money into India. We’re always looking for ways to get money into India because the reality is that it’s getting more difficult to do that, and we are looking for other ways that we’re able to do that. Given other information provided by GFA, this is a confusing statement. 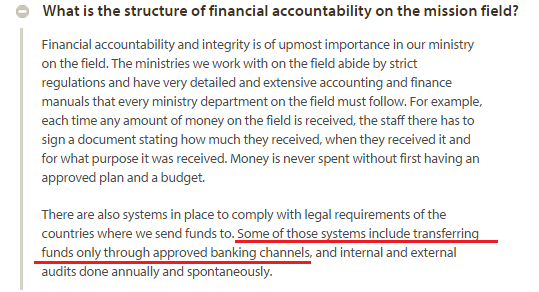 The sentence underlined in red says: “Some of those systems include transferring funds only through approved banking channels.” Carrying cash in backpacks is not an approved banking channel. As I have reported, money smurfing is a violation of both federal law and this website promise to donors. So hard or easy, moving money is only supposed to be done through banks. I have to also question if it is difficult to get money into India via legitimate means. According to the audited financial statement for 2012 and 2013, GFA started creating limited liability companies in 2009 to aid transfers of money to India. They now report 12 of them. GFA took $9 million which they needed for their new home office and transferred to that money to India for about a year to get better interest rates. Then they transferred it back. 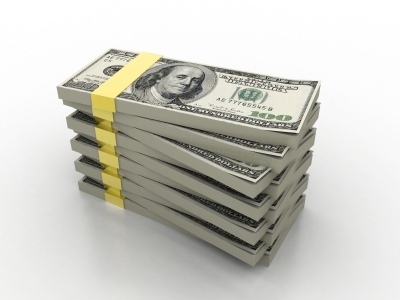 GFA was willing to place $9 million at risk; so how hard could it be to move money back and forth? GFA has admitted money smurfing but to my knowledge, there has been no explanation to staff about why the students and money was put at risk. I am aware that staff are very concerned about it as they should be. I encourage anyone who was asked by GFA to move cash on a trip to India (or elsewhere) to contact me at my email address (click the link). If you have questions about the matter, please feel free to contact me. Author Warren ThrockmortonPosted on June 4, 2015 Categories David Carroll, Gospel for Asia, K.P. YohannanTags Cash, David Carroll, Gospel for Asia, India, K.P. Yohannan, SmurfingLeave a comment on How Hard is it for Gospel for Asia to Get Money to the Field? GFA said in the audited financial statement over $58 million was sent to GFA India, but GFA in India reported only a little over $9 million being received (actually more like $6 million, see the last note below). **** So where is the rest of the money? As I reported in a prior post, GFA in America also sent money to at least three other charities in India: Believers’ Church (INR 909,041,794 = $20,601,500), Love India Ministries (INR 162173900 = $3,675,330) and Last Hour Ministries (INR 161084820 = $3,650,650) (click the links for their FC-6 forms). Looking at what came from the United States to all four of these entities, the total is $37,097,750 which still does not get us to the $58 million GFA claims came from the U.S.** It is possible that GFA – U.S. contributes to other ministries in India that have not been disclosed or discovered yet. However, just taking these reports at face value (what GFA says in the audited statement and what GFA tells the Indian government, there appears to be a significant discrepancy. Thus, at least two problems emerge for GFA’s credibility. One, GFA claimed in the audited financial statement that it only contributed to “five related non-profit organizations.” However, GFA in the U.S. uses 12 LLCs to send money to at least three additional registered charities in India (Believers’ Church, Love India Ministries and Last Hour Ministries) which are not disclosed in the audited financial statement. Two, the amounts GFA says they send to GFA in India comes nowhere close to matching what GFA – India reports to the Indian government. Thus far, GFA has remained silent in the face of questions regarding cash smurfing to India, video of Believers’ Church bishops bowing and kissing the ring of GFA president K.P. Yohannan in contradiction to Yohannan’s denials of the ritual, discrepancies in Bridge of Hope giving requests and spending, and cash hoarding in Indian bank accounts. These discrepancies being reported today now call into question the accuracy of the American audited financial statement. Silence may be a good PR strategy but it seems ill-suited for a Christian ministry. *It seems very unlikely that the different reporting years explains the $ million difference. Both methods of accounting cover 12 month periods which report consistent monthly giving totals year over year. **Contributions to GFA-India, Believers’ Church, Love India Ministries and Last Hour Ministries from all foreign sources (including interest on foreign contributions) totaled $54, 550,683 for fiscal year ending March 31, 2014, still less than the $58 million to India reported on the audited financial statement. ***As an aside, it is worth asking again why sending cash to India in student backpacks was ever done. 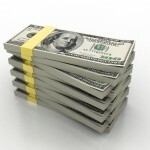 GFA told students it is a way to get cash into India. As one can see from the financial statement, GFA set up 12 LLCs to transfer money, and even transferred $9 million at one point just to get better interest payments. There appears to be no problem getting money back and forth from India. ****I remembered after doing the post that India’s FC-6 forms require a charity to record when the contributions are received. Thus, I was able to discern the amount sent during the calendar year 2013 but looking at the reports for the fiscal years 2012-2013 and 2013-2014. The situation is actually worse than I first reported. GFA – India reported that they received only $6 million in calendar year 2013. The American audit says GFA U.S. sent $58 million to GFA India in the calendar year but GFA India only reported $6 million in the same time span. 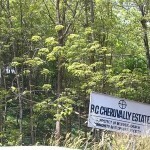 Today, Tehelka, an award winning Indian investigative magazine, posted an article about the loss of the Cheruvally Rubber plantation to the government. Even though I posted on this topic recently, I thought this article added some facts and was interested in the tone of the report. Kerala-based evangelist and self-consecrated archbishop Dr K P Yohannan has hit the headlines yet again, as the state government has recently issued orders to take over three estates his church body owns illegally. According to the government of India website, Gospel for Asia (GFA) – a Texas based charitable organisation – is funding ‘Believers Church’ for the purpose of charity to improve the condition of orphan children. Interestingly, both GFA and Believers Church are headed by Yohannan. The funds sent by GFA were used to purchase these estates instead of putting it to use for charity purposes. I have been curious about perception in India regarding GFA’s purchase of land for commercial purposes. The writer of this article takes the position that the foreign contributions were used to buy commercial properties rather than for the intended purpose. This is a serious charge and one which GFA should address. 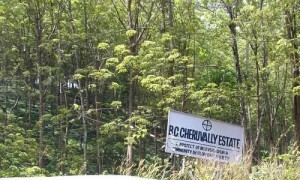 However, it has been learnt that Yohannan and his trust had spent Rs 300 crores on the plantation property. With the government now taking over the land, BC will in all probability face losses on their investments in these estates. 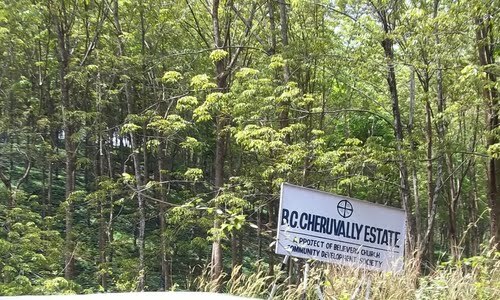 Moreover, BC would possibly be ineligible for any compensation as Harrison Malayalam sold the property to BC when the former had no right to sell the property. After the purchase, however, the property was mutated in the name of the Believers’ Church and tax was being paid by the BC itself under the Plantation Tax Act. Instead of $14.3 million, as I reported earlier, this article claims the price was much higher — $68.5 million. However, no source was given for the information which makes it impossible to verify. An implication of this report is that a massive amount of donor funds may be lost due to the purchase of this property. Although GFA in India may have believed it had the better legal case, it is a legitimate question whether or not donor money should have been risked in this manner. GFA has remained silent about a number of concerns recently raised by donors, former staff and students. Prominent among them is the report by former students that they were told to carry cash in backpacks and suitcases to India, seemingly at odds with American and possibly Indian law.